There is a large national park near Seoul called Bukhansan with mountains that overlook the city. Since Eb and I arrived in Seoul, we had been wanting to go on a popular hike to the top of the highest peak, called Baegundae. We have been putting it off as the free days that we have off from work are the days that have had heavy pollution. No way in hell do we want to be halfway up the mountain sucking in deep breaths full of pollution, although this morning we woke up to somewhat clear skies! (yewww). 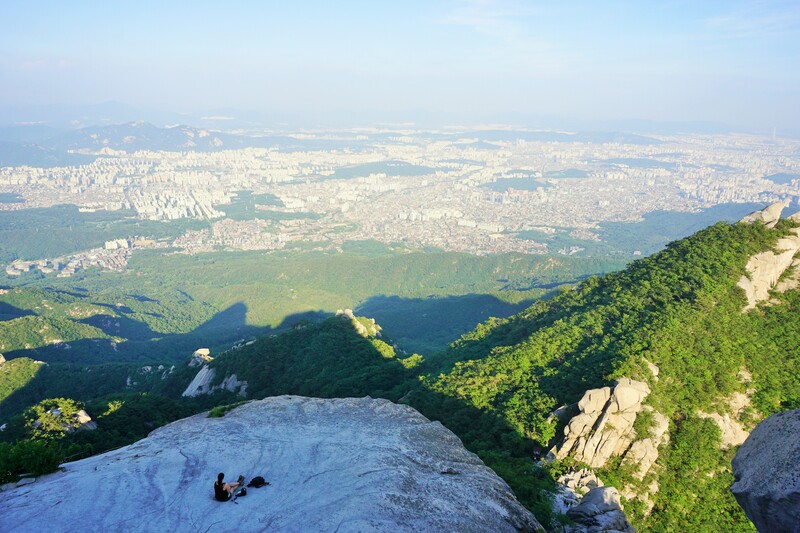 Baegundae sits at 836m high and has many hiking trails that lead to the peak. Eb and I laced up our hiking boots for the first time since The Faroes and Iceland, which felt very weird (we miss you Faroes and Iceland). I filled two bottles of water and Eb prepared 4 egg sandwiches and banana chips for us to fuel our bodies as we make the climb. The walk up to Baegundae peak from Jeongneung information centre was estimated to take 3-3.5 hours without stopping and taking photos, and the walk down on the other side of the mountain would take 1-2 hours, according to the reviews online. We left our hostel in Itaewon around 1:30pm caught two trains and one bus on the way to Jeongneung information center. We were equipped with a map and were showed which route to take and how long it would roughly take and we were on our way. We bought two changes of clothes as we had clothes to wear on public transport and the other to climb the mountains. Some old school South Koreans are quite conservative and don’t like seeing girls’ bare shoulders (although it seems mini shorts/skirts are allowed), and I didn’t want to wear my tank top as I never ever see guys wearing tank tops on public transport. The old people are quick to tell off people if they don’t agree with what someone’s wearing. Anyways, we made a quick change in the bathroom before heading up. We were literally heading straight up. We thought we’d at least get to ease into it but nope, straight up… and up… and up! We were huffing and puffing heavily and felt like giving up after 20 mins! We were determined to get to the top and continued on. 3.5 hours later we finally reached the peak of Baegundae. It was such a pretty view. We kept on thinking back to the French alps where we cycled 1000+ meters high but you couldn’t really tell how high you were because everything was elevated, compared to here, where you can see the city at ground level, so it made us realize how high we were in the French alps. Another cool thing is Bukhansan national park is located near the border of South and North Korea, so at the peak of Baegundae, you could see North Korea! Eb and I ate our egg sandwiches and enjoyed this view. We hung out at the top for an hour and then made the dreaded descend back down to ground level. It took us an hour to get to the bottom. Night began to fall as we made our way back to the hostel. Our muscles are aching and we were both a little dehydrated and so hungry, but it was such an enjoyable day and it was so worth it. Directions – Getting to Jeongneung information center. From the subway go to Gireum Station (line 4). Take exit 3 and take bus 110B to the last bus stop. Walk 5 minutes towards Bukhansan National park and you will find Jeoneung information Center where they will give you a map and instructions.